Born on the Great Plains in 1863, Minnesota designer and inventor Charles F. Kilgore developed a passion for Native American art. Year by year over the course of his life, he found and collected extraordinary pieces crafted by the Lakota, Chippewa, Blackfeet and other tribes across the Northern plains. By the end of his life in 1941 he had amassed a collection of over 70 priceless works—including intricately beaded moccasins, a painted ceremonial drum, brightly-colored, hand-loomed clothing and much more. This summer, at the request of Kilgore’s own descendants, his stunning collection became a part of The Heritage Center’s. Kilgore’s family always wanted a museum to care of his beloved artwork—to ensure each piece would be preserved for future generations. 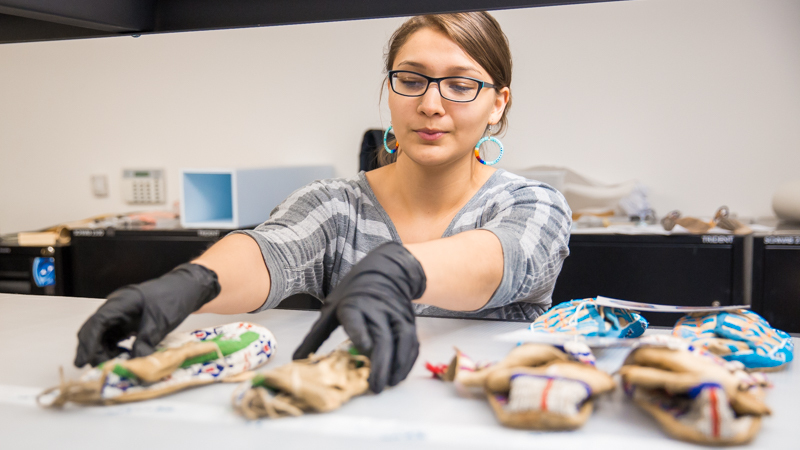 They also believed that the collection should go to an institution with strong connections to Native people and communities. After careful research, Kilgore’s family selected The Heritage Center, based on its long-standing presence in Indian Country and its deep commitment to preserving and celebrating all Native art. Before delivering its contents to The Heritage Center, the Kilgore family worked with an expert assessor to create a detailed catalog of the collection. In doing so they learned more about the unique character of each piece. The collection includes a series of 22 well-preserved ledger drawings, many depicting riders and their horses preparing for battle. Native people created these images to record important events in history, using ledger paper brought to the region by government agents, military officers, traders, and other settlers. As The Center’s curator Ashley Pourier explained, these drawings represent a rare first-person account of life on the plains during a time of transition, conflict, and grief. The collection includes many other noteworthy pieces. There is a Lakota woman’s dress featuring delicate beadwork and a unique design. Another piece—a traditional cradle cover that is intricately hand-beaded and fringed with hawk bells—would have been used to express love and adoration for the child carried in it. And a matching pair of brightly beaded saddle bags would have bestowed honor and reverence on the horse they adorned. Each piece sheds light on an important aspect of traditional life. And for Pourier, that means being able to develop even richer, more inspiring exhibitions.